EK Water Blocks upgrades its water-cooling kits with the newer version of the award-winning EK-Vardar fan. The previous EK liquid cooling kits feature the EK-Vardar F3-120 with a maximum speed of 1850 RPM. The new EK liquid cooling kits will now sport the EK-Vardar F4-120ER with a maximum speed of 2200 RPM, enabling a wider speed range that allows either quiet operation or more cooling power. The EK-Vardar F4-120ER comes with a better PWM duty cycle of 25% to 100% compared to the F3-120’s 50% to 100% offering a more silent operation option. 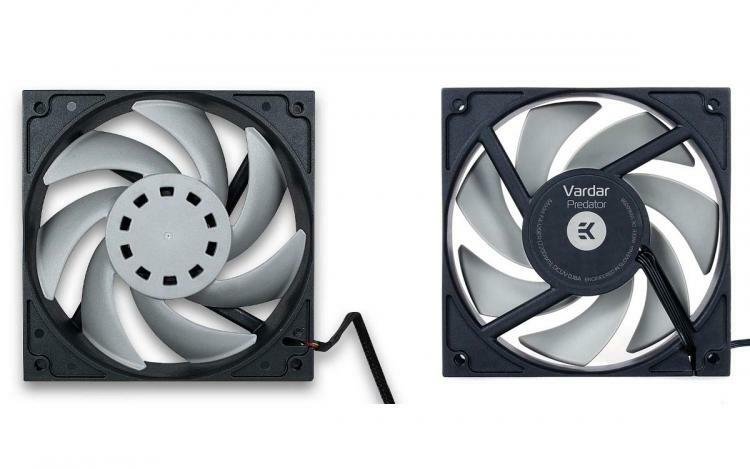 The EK-Vardar Series is an industrial grade high-static pressure computer cooling fan, designed and built primarily for highest-performance computer liquid cooling systems. EK-Vardar is simply the best choice for computer radiator cooling as it provides unmatched performance throughout the entire operating range. EK Water Blocks will be updating the following liquid cooling kits listed below with the newer EK-Vardar F4-120ER fan. EKWB retains the MSRP of the affected kits. Users can also add additional socket support for the AMD AM4 free of charge.